The Secretary-General of Hezbollah, Sayyed Hassan Nasrallah, tackled on Thursday the latest developments on the scene, sending heartfelt tribute to the fighters who are putting their lives in jeopardy on the battle fronts on the Lebanese-Syrian border, thus saluting "the Lebanese Army, the Syrian Army and the Resistance fighters, especially the martyrs and the wounded among them." "The headlines around which the battle revolves are, on one hand, the Lebanese dimension which consists of expulsing Daesh from the entire Lebanese territory; from Arsal, al-Qaa and Ras Baalbek, as well as securing the Lebanese-Syrian border, which requires sending Daesh away into the Syrian territory so as to no longer pose a threat to the Lebanese Army," he said, assuring that Daesh's further spread at the border would deplete the LAF and its forces along the borderline. "The goal is also to reveal the fate of the kidnapped soldiers," Nasrallah stressed as well. "On the Syrian level, the target is to regain control over the entire Western Qalamoun and end the existence of Daesh there, after mountains and hills on the Syrian side of the border formed a threat to the Lebanese towns, the Syrian inside and the Damascus-Homs road. When Daesh is defeated in West Qalamoun, Homs is safe again," he said. "The Resistance is fighting with both dimensions in mind. It is making sacrifices out of belief in the non-division of the battle." Tackling the course of the fight so far, the Hezbollah secretary-general said "After the marginal work on Saturday, the Army command announced the beginning of Fajr El-Jouroud operation. Simultaneously, an operation (...) was launched by the Resistance on the Syrian side. What has thus far been achieved on both sides is of major importance given the difficult geographic area and the presumed nature of the enemy, Daesh." "The Army Command has announced the liberation of 100 km of land, with only twenty kilometers left to battle for," he said, praising "the work of the LAF and what it achieved at the lowest possible cost and with utmost efficiency." He said that Daesh militants were now trapped inside a vast operations area between Lebanon and Syria, noting that there is a precise count of the number of militants and civilians in that besieged area. Sayyed Nasrallah praised the psychological state of mind of the Syrian Army and the Resistance on the fronts, and their deep-rooted belief in victory," pointing out that "it is only a matter of time [before the battle ends]," and calling "not to set time limits for this battle." "The narrower the battle area, the bigger the cost, because of the presence of civilians (...) and because Daesh uses those civilians as human shields, like it did in Iraq." "The Syrian leadership and the Resistance confirm that there will be no commitment to negotiations with Daesh unless it is tied to revealing the fate of the Lebanese soldiers abducted by the group," he announced, stressing that "the resistance acts as though the battle was one; and on one front," promising the Army Command and the families of the kidnapped "not to accept any solution beyond revealing the fate of the kidnapped Lebanese military personnel." He revealed thereon "the responsiveness of the Syrian leadership, as we were told, but in accordance with cooperation with the Lebanese government in the next phase." 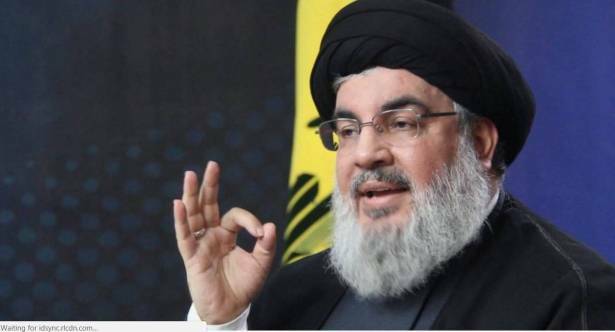 The Sayyed explained that "the Resistance is negotiating without coordination or mandate from the Lebanese government, apart from formalities." "We are most likely headed towards ending it [the battle] militarily, and the reason behind that is the mentality of the Daesh leadership abroad, unlike the group's leadership in Qalamoun which tends towards seeking negotiation." Addressing the Lebanese people, Nasrallah said "You are on the verge of a new victory that you should be proud of. When this victory is achieved, we will have a Lebanese-Syrian border safe from terrorists." He promised to delve later into the details that reveal those who truly favored sovereignty and thus wanted the battle to happen, and those who did not, hoping to "overcome some of the ambiguities around this issue." Calling on some media outlets not to surrender to foreign [US] threats that poured at them following the coverage they provided to the Arsal battle led by Hezbollah, Nasrallah told those outlets that failing to cover the western Qalamoun battle and everything going on at the Syrian side of the border would strip them off of their credibility. "This great achievement (...) is one of the results of the golden Army-people-Resistance formula, added to it the Syrian Army," he said, disregarding those who might be offended by his words. "The integration between the Lebanese and Syrian fronts is what accelerated the achievement of victory. (...) The second Liberation Day would be the day when the Lebanese-Syrian borders are completely freed from the hegemony of the Takfiri terrorists. This day must be in 2017, but the month and day are to be set later," he concluded.